With the closest departure to Molokini Crater, Kai Kanani enjoys exclusive shore-entry at Maluaka Beach in Makena. Get there faster on one of the most beautiful sailing catamarans in Maui, Hawaii. The Kai Kanani is never crowded due to the spacious deck and cabin area. Enjoy continental breakfast, deli lunch, beverages, beers on tap and cocktails. You’ll be given quality snorkel gear, flotation devices, and snorkel instruction. Marine Naturalists will guide you through the waters as you arrive at Molokini Crater in less time than any other vessel! Snorkeling Molokini aboard the Pride of Maui in the care of their expert Captains and crew means you can relax. Come in your bathing suit, and let them take care of all the details. You will be equipped with comfortable, sanitized, professional snorkel gear and everything you need to fully explore the underwater sanctuary of Molokini Crater. Includes continental breakfast, BBQ lunch, snacks, soft drinks, juice, filtered water, beer, wine, mai tais (alcohol after snorkeling), snorkel gear, floatation devices, optical masks and snorkel instruction. This deluxe 55′ sailing catamaran was designed and built for 1 main purpose: Sailing to Molokini Crater and giving visitors the best trip possible. Maui Classic Charters has succeeded in this by developing a high-quality, stable catamaran with fantastic features such as a large glassbottom viewing room. They’re equipped with twin grills to make delicious food and the wet bar is prepped and ready for your ride back. Four Winds II has a shaded upper deck as well as a comfortable cabin for before and after your snorkeling, snuba diving or scuba dive experience. Trilogy operates 2 catamarans to Molokini: a 64′ Custom SeaRunner/Cutter Rigged Sailing Catamaran and a 55′ Searunner/Sloop Rigged Catamaran. Both vessels average around 20 or so less passengers each trip than they are licensed for. That means you have far more room to leisurely roam around these large vessels. Some of our personal favorite characteristics of the Trilogy trips include their legendary fresh baked cinnamon rolls, fresh fruit, and kona coffee breakfast. They also have 2 snorkel sites, so you can always avoid the more crowded spots. Their lunch is great and the crew are a lot of fun! If you’re ready to spice up your snorkeling on Maui, hop aboard the Redline Raft, a much more intimate way to experience the ocean, which jets you around to many of the island’s most beautiful spots, including the front side and less visited back side of Molokini Crater, La Perouse Bay, where you’ll get the opportunity to see the famous Hawaiian Spinner Dolphins up close while brushing up on your geology knowledge, and finally Turtle Town, where you’ll snorkel with protected Hawaiian Green Sea Turtles. Includes breakfast, deli lunch, shortie wetsuit and all snorkel gear. Underwater camera rental available. Great staff and a fun adventure! Malolo, 55 foot catamaran, is an excellent budget option for Maui travelers who are interested in seeing the beauty of Maui’s unique marine life. The Sunday morning Malolo snorkeling tour to Molokini Crater includes all snorkeling equipment, snorkeling instruction, breakfast, lunch, and beverages throughout the day. This is definitely one of the best prices you’ll find for trips to the crater, where visibility often exceeds 150 feet, so hop aboard and experience it for yourself. A 65’ double decker luxury adventure yacht, the Lahaina Princess is the ideal vessel for cruising to Molokini Crater for an epic snorkeling adventure alongside friends and family. Enjoy the views from the shaded interior cabin, or head to the top deck for fresh air, sunshine and an excellent viewpoint for spotting Maui’s plentiful marine life. With its easy swim up platform, guests will enjoy a memorable snorkeling experience at both Molokini Crater and a second location at the captain’s discretion. All tours include premium snorkeling equipment and instruction, flotation devices, a deli-style buffet lunch and unlimited non-alcoholic beverages. Excellent value and service! 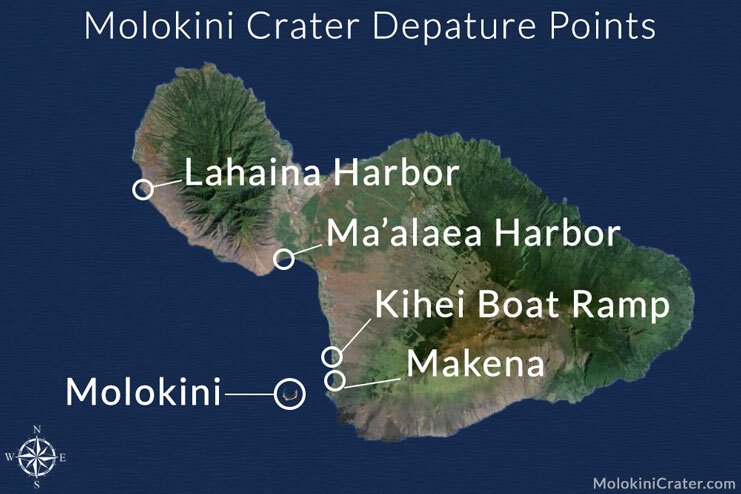 Ma’alaea Harbor is the most popular departure and centrally located. Lahaina harbor is convenient for those on the west side. Kihei Boat Ramp allows for a few vessels to depart from this convenient location, including Redline Rafting. Fast raft out of launching from Kihei Boat Ramp. Sailing catamaran from Maalaea Harbor. Multiple trips and vessels to Molokini from Maalaea. Beautiful sailing catamaran from Maalaea Harbor. A mid-sized twin-hulled catamaran out of Maalaea. A large boat out of west Maui's Lahaina Harbor. Large power catamaran from Maalaea Harbor.